Does this yarn look familiar? It should! This is the very same yarn that I used to make my Unicorn Stripes Baby Blanket - the free crochet pattern on my blog last week. I'm not one to waste yarn (especially not yarn as much fun as the new Red Heart Super Saver Stripes! ), and I thought a sweet, newborn-sized baby hat would be the perfect way to use the rest of my last skein. A baby blanket and matching hat would make a lovely baby gift, don't you think?! Red Heart Super Saver Stripes - I used what was left after making my Unicorn Stripes Baby Blanket. Puff (Puff Stitch): (Yarn over hook and pull up a loop) repeat 3 times in the next stitch. You will have 7 loops on your hook. Yarn over and pull through all 7 loops. Diameter (at bottom): approx. 6"
This hat pattern is written in newborn size. 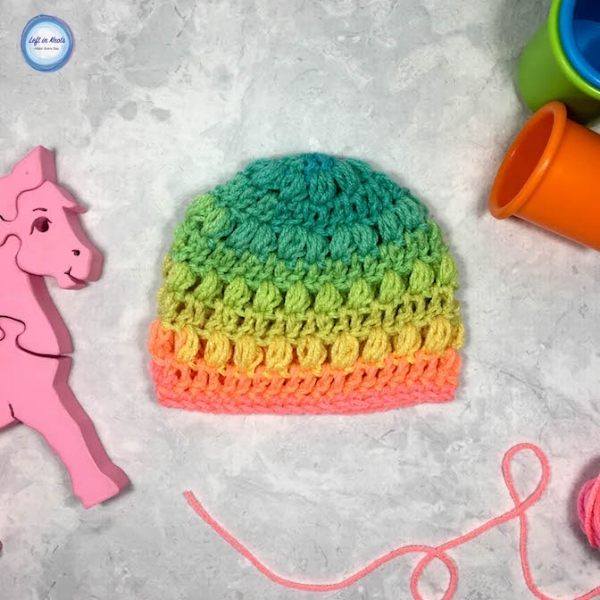 Have you gotten your hands on the new Super Saver Stripes or Ombre yarn yet? Red Heart very kindly sent me some of these to play with as well, so there will be more free patterns with this yarn coming!